When November rolls around in Arizona, high school cross country runners can think only about getting to Cave Creek Golf course for the AIA State CC Championships. It easily stands as one of the hilliest courses in Arizona, if not the hilliest course faced by many Phoenix runners. So, when the big dance arrives, Arizona's contenders know how to race the rolling hills and drive their knees up the big ones. The Division 4 Boys race opened the State Meet at 8:30 am. Jordan Black (North Phoenix Prep) wasted no time in seizing the lead and pressing the pace throughout the whole course. Over the third mile, Jihad Nodman (Hopi, Sr.) would take over the chase from Micah Stanton (Northland Preparatory Academy, Sr.) with Adam Whitehead (Arete Prep, Jr.) and Talon Smith (Joseph City, Sr.) still in the mix. Back at the finish line, spectators faintly whispered speculation over who would take the D4 Boys Title until the tall lanky figure cresting over the hill confirmed everyone's predictions. Jordan Black had pulled away with an insurmountable lead. Loudest among the spectators, the patriarch of the Black family Michael could be heard cheering "Yeah! Yeah! 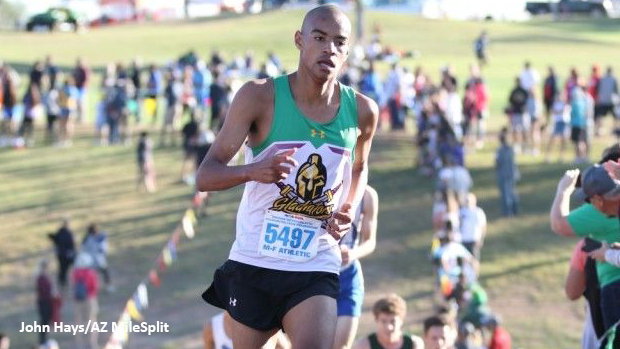 as Black cruised to the finish and pulled the tape apart in a time of 16:05 for the first individual State Title in school history for the North Phoenix Gladiators. Nodman held off Whitehead in 16:18 for a runner-up finish, while Stanton clocked in at 16:29 for 4th place finish. While Black had broken away from the field, the Northland Prep boys had their sights set on a repeat State Title. Within just the first mile of the race, the Spartans had their core nucleus of Stanton, Hayden Anderson (Jr.), and Brandon Bounds (Jr.) spearheading the charge for the returning champions and by the mid-race hill they had placed all of their scoring varsity among the top 15 runners. Challenging Northland Prep were the Hopi Bruins looking to redeem their broken State Championship streak from last year. Though the Bruins reeled in as many guys as they could to shrink their score, it wasn't enough to put them over the top against their Flagstaff rivals. Northland Prep finished with six of their Varsity among the top-15 finishers and a total of 37 points to win their second consecutive State Title. Hopi would take the runner-up title with just 67 points.